There are a number of animal career options that offer a salary in the range of $50,000 or more per year. Veterinary pharmaceutical sales reps market a variety of animal health products to veterinarians and veterinary clinics. There are both inside sales (office based) and outside sales (travel) career paths in this field. The salary for pharmaceutical sales reps usually includes a combination of base salary, commission, company car, and benefits. Total compensation varies based on sales volume and years of experience, but salary usually ranges from $59,122 to $119,826 according to Payscale.com. Pet product sales reps (also known as manufacturers’ reps) market a variety of pet products such as food, treats, toys, accessories, and crates. There are both inside sales (office based) and outside sales (travel) career paths in this field. The salary for pet product sales reps often includes a combination of base salary, commission, company car, and bonuses. According to Indeed.com, the average salary for positions in this field was $79,000 in 2011. The Bureau of Labor Statistics reported a similar median wage of $70,200 for sales reps in a 2008 salary survey. Livestock feed sales reps market feed products to dealers and livestock production farms. Most positions are field based. The salary for a livestock feed sales rep often includes a combination of base salary, commission, company car, and bonuses. The median wage is $70,200 according to the BLS but can vary widely based on sales volume. Veterinarians provide health care to a variety of species. Vets can operate as small animal, large animal, equine, exotic, or mixed practice providers. 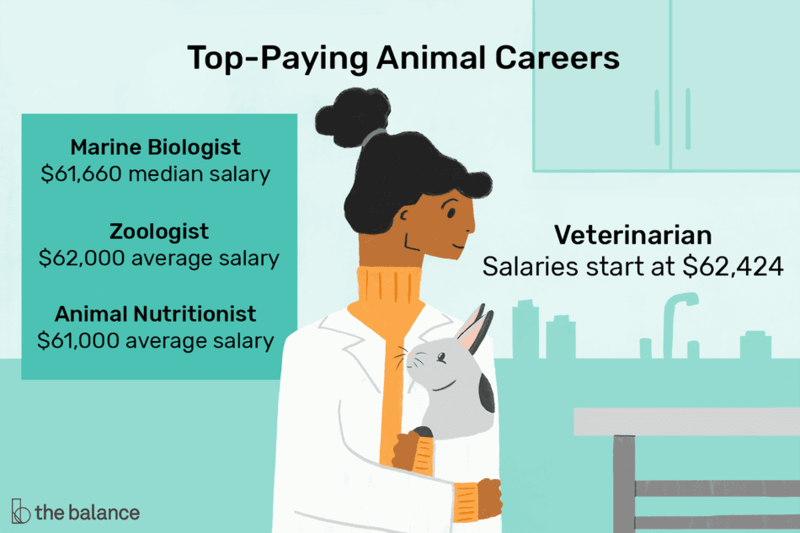 According to the American Veterinary Medical Association, the average salary for veterinarians right out of school is $62,424 for small animal practitioners and $64,744 for large animal practitioners. The average salary for established practitioners is $97,000 for companion animal practice, $85,000 for equine practice, and $103,000 for food animal practice. Board certified specialists can earn much higher salaries. Farriers (sometimes referred to as blacksmiths) provide comprehensive equine foot care services. Duties generally involve routine trimming, modifying and applying shoes, and evaluating potential causes of lameness. A farrier’s salary depends on how many horses he can service per day. A 2011 survey from the American Farriers Journal indicated that experienced full-time farriers earn an average salary of $92,600 (up from an average salary of $80,000 in 2008). Marine biologists study a wide variety of aquatic life, though many choose to specialize in working with a specific species or group of animals. Marine biologists may work in research, education, or private industry. A marine biologist’s salary can vary from $40,000 for entry-level work to more than $110,000 for scientists with significant experience or advanced degrees. Wildlife biologists manage and study populations of animals in the wild. Duties may involve animal census studies, trapping and tagging animals, and developing habitat management plans. Wildlife biologists may work in education, research, or for the state or federal government. According to the 2010 BLS salary survey, the median salary for wildlife biologists was $61,660. Positions with the federal government offered an annual mean wage of $77,030, while positions in research offered a similar annual mean wage of $72,410. Zoologists are biologists that study a variety of animal species; most upper-level positions require a Ph.D. degree. They may be involved with research, management, and education. Zoologists frequently work at zoos, aquariums, and in positions for the state or federal government. According to Indeed.com, the average salary for zoologists is $62,000. Positions with the government or in research roles offered higher annual mean wages above $70,000. Animal nutritionists create and balance animal rations to ensure dietary requirements are met. Positions in this field can be found with a wide variety of employers such as zoos, colleges, research labs, farms, pharmaceutical companies, and feed development companies. Animal nutritionists earned an average salary of $61,000 in 2011 according to SimplyHired.com. The BLS quoted a similar salary of $60,180 in its 2010 salary study for food scientists. BLS data also indicated scientists employed by the animal food manufacturing industry earned about $70,060. Fish and game wardens are authorized to enforce rules and regulations related to wildlife in their patrol area. Wardens may arrest violators, seize weapons or game, assist with research, and investigate the damage caused by wildlife. According to the BLS, the annual mean salary for fish and game wardens is $56,540 for state government positions and $49,420 for local government positions.